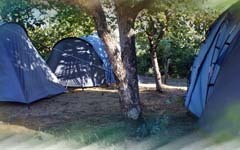 Campground Friera is located on the north side of Etna between Piedimonte Etneo and Linguaglossa town. 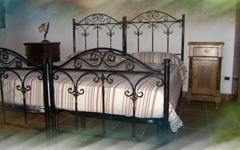 The extension of the farm is 2 hectares, inside, orchards and woods cheer up the staying guests. The presence of a millstone in a old house dated, 1860, perfectly preserved, enjoy during the winter evenings with its fireplace to taste the serenity of other past time and in the summer provides shade and respite from the warm of our beautiful Sicilian sun. Surrounded in lush wilderness of Etna, our camping enjoys peace and quiet and offers a splendid view of its summit part, where the volcano was awake, offers a spectacular blaze of explosions and lava flows. The location of our camp is considered as strategic, located midway (approximately 12 km) between the sea and skiing facilities, well-known is the chairlift on the north side of Etna, ideal for skiing in winter. Also discover the northern side of the highest active volcano in Europe, following the traces left over from previous volcanic eruptions is simple with the ability to make long or short walks or hikes true for those who love trekking at various levels of difficulty . The same distance (12 km) separates the campground from the Alcantara Gorges and Taormina reached by car or by public transport, as well as all the Etna villages, the coast, the sights, Catania with its heritage greek-roman Baroque, Bellini airport. One interesting feature is the railroad Circumetnea (district lands in Linguaglossa) that lets you visit the tourist train (littorina) in the villages surrounding our volcano. "At the campground offers a reception in the open air, in the" good spirit "service the increasingly diverse and well-organized. Large spaces that allow the right distance between us and the neighbors, a few guests who recognize and salute, and only essential services in order to rediscover the taste to do itself." Questa pagina utilizza un iframe che non pu� essere visualizzato con il browser attualmente usato. clicca qui per vederne il contenuto!